The Scientists of Shark Week 2016: East Coast Edition – Ya Like Dags? Shark Week 2016 is upon us, and this year’s lineup appears to follow the trend Discovery started last year with a more science-based, pro-shark, reduced-fear approach. David “WhySharksMatter” Shiffman has already weighed in on which shows to watch and which to avoid this year, and it looks like the vast majority fall into the “watch” category. With the increased focus on science, rather than put my own feelings on this year’s lineup (which would be entirely redundant with David’s), I want to give a little background on some of the great researchers and labs featured on Shark Week 2016. Here’s who the scientists of Shark Week 2016 are, what they do, and what else they’re up to when not on camera with sharks. Note that this is nowhere near a comprehensive listing of all the great researchers involved in Shark Week and definitely reflects an east coast bias on my part. This post will be updated as I spot more researchers who weren’t named in the episode descriptions. Look for the “West Coast and Elsewhere” edition soon. Tagging great whites off of Cape Cod, Massachusetts. Image from the Atlantic White Shark Conservancy. Massachusetts Division of Marine Fisheries biologists Greg Skomal and John Chisholm have been on some of the better Shark Week offerings of the last few years, mostly focusing on the return of great white sharks to New England waters. This year their work with white sharks will appear twice, first on Monday with “Jaws of the Deep,” where Skomal and a team from the Woods Hole Oceanographic Institute will be putting an ROV into white shark hunting grounds off Guadalupe Island, then on Friday with “Shark Bait,” which focuses on the role of recovering seal populations in bringing great whites back to Cape Cod. Skomal and Chisholm both work closely with the Atlantic White Shark Conservancy, which supports research on the burgeoning white shark population of the Northwestern Atlantic Ocean. As biologists working for a state fisheries management agency, they’re also heavily involved in the management of shark fisheries through surveys, stock assessments, and advisory councils at a state level and coast-wide through the Atlantic States Marine Fisheries Commission, various regional councils, and the NMFS Highly Migratory Species division. 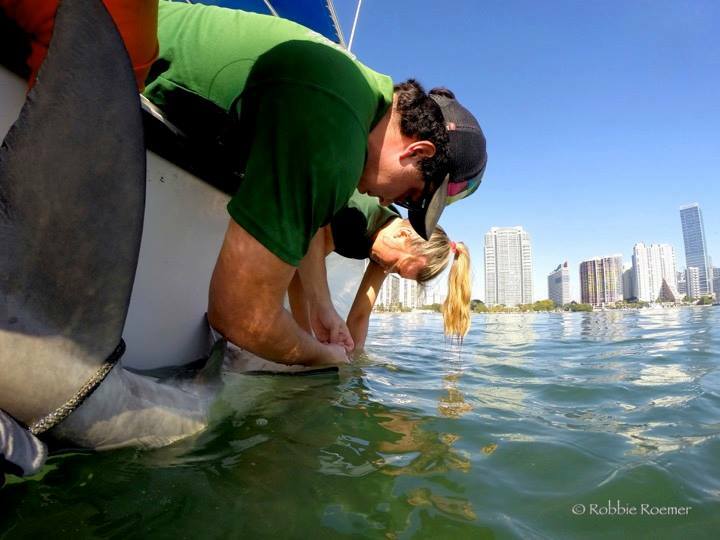 Shark tagging with the Miami skyline. Photo from the University of Miami Shark Conservation and Research Program. Neil Hammerschlag and the Shark Research and Conservation Program and the University of Miami are all over Shark Week this year, and are even pulling double-duty appearing Nat Geo’s Shark Fest as well. You can see them kicking the whole thing off on Sunday with “Tiger Beach,” then Hammerschlag appears on “Air Jaws: Night Stalker” on Tuesday, and if you feel like flipping channels on Sunday you can also see their work on “Mega Hammerhead” on Nat Geo Wild. The good folks in this lab are involved in a dizzying array of projects that go beyond shark research to look at marine environments at a whole-ecosystem level. They also do an incredible job with education and outreach, and have even folded their outreach efforts directly into their day-to-day research. Tagging a great hammerhead in the Gulf of Mexico. Image from the Center for Sportfish Science and Conservation. Greg Stunz and his team at the Center for Sportfish Science and Conservation, part of the Harte Research Institute at Texas A&M Corpus Christi, were involved in last year’s “Monster Mako” and are back on Sunday with the appropriately-titled “Return of Monster Mako.” The CSSC researchers cover a wide variety of subjects related to recreational fisheries in the Gulf of Mexico and sharks are only one of their focus areas. If fishing is a key part of your trips to the coast, you should definitely check out the CSSC’s work. Juvenile bull shark in the Everglades. Photo by Michael Heithaus. Michael Heithaus and his lab at Florida International University focus on ecosystem interactions involving marine predators. Heithaus appears on Wednesday’s “Sharks vs. Dolphins: Face Off,” which promises to upend some popular (but untrue) beliefs about shark/dolphin interactions. The Heithaus lab is probably best known for their whole-ecosystem-scale work in Shark Bay, Australia, but they also work with marine and aquatic predators, including bull sharks, alligators, and snook, a little closer to home in the Everglades. A lot of what is currently known about the importance of sharks in marine food webs comes from research conducted by this lab. Tagging blue sharks in balmy water. Image from the University of New England. Hailing from the cold waters of coastal Maine, James Sulikowski appears on Sunday’s “Tiger Beach” armed with a portable ultrasound unit used to noninvasively look at developing pups in pregnant female sharks. His lab at the University of New England studies sharks, sturgeon, and other fish in northern New England. These cold-water species tend to get a little less research attention due mostly to the fact that it looks a lot more fun to study fish in the tropics, so it’s great to see a lab focusing on the sharks living in water that requires a dry suit to dive in. Sulikowski has also been involved in some pretty ground-breaking satellite tagging studies of spiny dogfish. Studying lemon sharks in considerably warmer waters. Image by Matthew Potenski from Bimini Sharklab. The Bimini Sharklab, founded by the legendary Samuel Gruber, needs no introduction in shark research circles. They’re a Shark Week mainstay, appearing this year on Monday’s “Shallow Water Invasion.” This lab has conducted long-term tagging surveys, genetic sampling, behavioral studies, and more focusing on the sharks around the island of Bimini since 1990. This lab is very student-focused and many of today’s best-known shark researchers have spent time there as interns. There are many other worthy researchers and filmmakers involved with Shark Week 2016, which is looking to be one of the best lineups in recent memory. I likely won’t be able to catch everything in real-time, but when I do look for my live-tweeted impressions at @SpinyDag. Happy Shark Week everyone! Or, if you’d rather hide from all the shark madness this week (which I don’t understand, but won’t begrudge), check out Jacques Week at Southern Fried Science. Update 06/27/16 – Updated to include the Sulikowski lab and Bimini Sharklab. Also some minor grammatical and spelling corrections.